Make this your year! 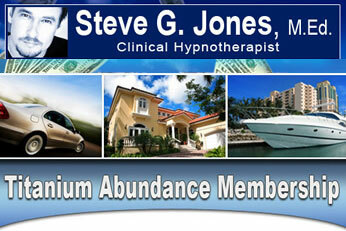 Unlock the sources of wealth with the keys of Steve G. Jones’ Abundance Titanium Membership. Use Steve’s brand new hypnosis recordings to learn the proven methods of success and achieve the security and abundance that you’ve always dreamed of. Learn to conquer the most common fears that stand in the way of your achievement, and watch the barriers that are keeping you from reaching the next level will fall away. Become motivated to discover your full potential when you become a more confident and affirmative person, and watch your success grow! Use these state of the art recordings to become a fearless decision maker and master visualization techniques that will get you to your goal of prosperity. Through the Abundance Series, you will learn to balance financial success with a successful and fulfilling personal life, and master the social skills you need to create the wealth you want. The Abundance recordings will help you to achieve harmony between all of your life goals for the year- take action! The Abundance Titanium Series is now available EXCLUSIVELY through GetHypnosis.com. Through this great private introductory offer, you can get Steve’s brand new, high- powered recordings through easy, affordable monthly payments of $18.95. Receive a new recording every month to help keep you focused on your wealth and prosperity goals. Take advantage of this AMAZING value to gain the skills to gain abundance and become successful! Sign up for “Abundance Titanium Membership″ for only $18.95/month and you get one new Titanium release per month which deals with abundance. This is an Automatic Recurring Charge. Upon payment you will receive your username and password to download your first product and each subsequent product every month thereafter. Are You Ready To Live Your Most Abundant Life EVER ? Click Here To Enroll Now!